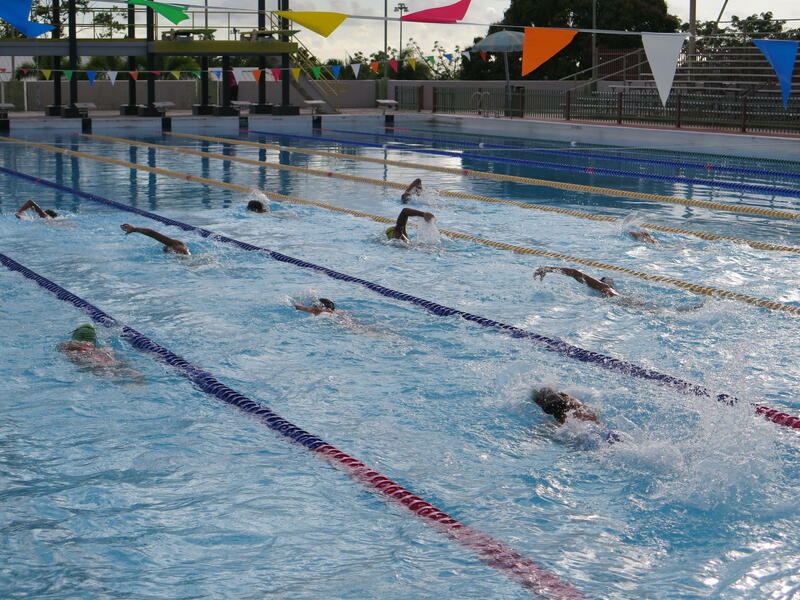 At the Germán Rieckehoff Olympic Village in Salinas, Puerto Rico young athletes train in this swimming pool. 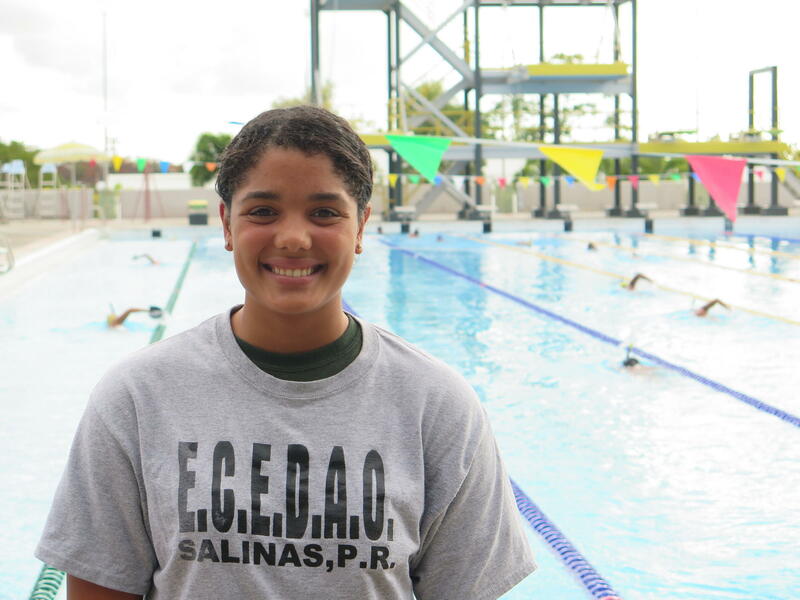 Paola Santiago is preparing to try out for the national swim team of Puerto Rico. She says she wants to make her island proud, just like tennis player Monica Puig did at the Rio Olympics. 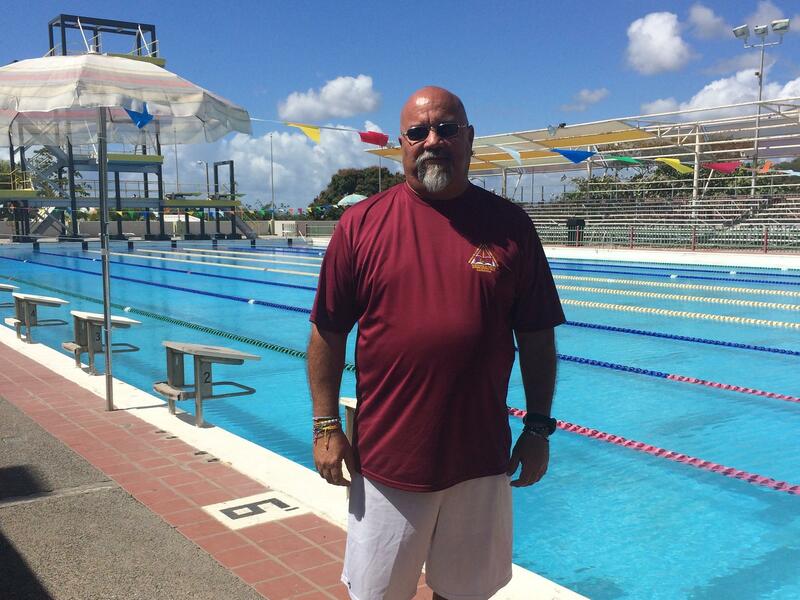 Swim coach Fernando Delgado at the Germán Rieckehoff Olympic Village in Salinas, Puerto Rico. This week, Puerto Ricans marked a century since they were granted U.S. citizenship by Congress, though it's a limited form of citizenship. Puerto Ricans on the island can't vote for the U.S. president in the general election and they lack representation in Congress. There is, however, one avenue where Puerto Ricans enjoy status as an "independent entity" — that's at the Olympics, where Puerto Ricans compete under their own flag. Puerto Rico is a member of the International Olympic Committee. The island has an expansive Olympic Village in Salinas — about an hour south of San Juan — where young athletes train. On this sunny and breezy afternoon, swimmers jump into the Olympic-size swimming pool to warm up for a two and a half hour training session. This sports facility has a boarding school for grades seven through 12. Young people from around the island try out for athletic scholarships that could lead to a spot on Puerto Rico's Olympic team, but there are no guarantees. Seventeen-year-old Paola Santiago, who started swimming at the age of 5, says, "It's an honor to represent Puerto Rico, our country in the sports," even if it means hard work and sacrifice. Like Santiago, most Puerto Ricans refer to the island as "pais" or country even though it is not — it's a U.S. territory. The thought of trying out for the U.S. swim team has never crossed her mind. "I wouldn't feel that happy," she says, "because I feel like I feel more comfortable being here and represent Puerto Rico, I don't live there, I don't do anything there." "There," meaning the mainland U.S.
Santiago smiles easily, even when she's on her second daily two-hour-long training session. She's preparing to try out for the Puerto Rican national swim team this April. She says she wants to make her island proud, just like tennis player Monica Puig did last summer in Rio. Puig, an underdog from the outset, defeated World No. 2 seed Angelique Kerber of Germany to cop gold medal in the women's singles final. That winning match sent Puerto Ricans into a collective explosion of pride — Puig's gold medal was the first ever in Puerto Rico's Olympic history. Almost everyone on the island feels passionate about competitive sports — including politicians of all parties. "Puerto Ricans value the sovereignty that we have in terms of sport," says Manuel Natal, a member of Puerto Rico's House of Representatives. "It's something that's part of our national identity." Governor Ricardo Rosello, whose party is pushing for Puerto Rico to become the 51st state in the U.S., is especially proud of tennis player Monica Puig's gold medal. "You know, it's a great pride to us," he says. "I feel just as proud, being from Puerto Rico ... just as I'm sure Texans feel pride when somebody from Texas wins a gold medal." Texans don't compete as a state, however, but as part of the U.S. national team. At the Olympic Village in Salinas, swim coach Fernando Delgado runs the stopwatch on the pool deck, timing each of his 23 swimmers with precision. Delgado has been coaching here for 31 years and he's marched alongside Puerto Rican athletes in several Olympic ceremonies around the world. "I can't explain you the emotion that we feel, the feelings about that moment," he says in reference to parading at Olympic ceremonies. At a loss for words, he points to the goosebumps on his large tanned arms as a way to explain his emotions. Delgado's overwhelming pride in Puerto Rico's athletic independence is shared by many on the island. "This is the only arena where we feel like an independent nation," he says. This week, Puerto Ricans mark the centennial of Congress granting U.S. citizenship to those born on the island. In the years since, many Puerto Ricans have had to navigate a complicated dual identity. But one area in which they are distinctly Puerto Rican and on par with the United States is at the Olympics. NPR's Marisa Penaloza spoke with Puerto Rican athletes about their decision to go for Team Puerto Rico or Team USA. MARISA PENALOZA, BYLINE: It's a breezy, sunny afternoon at Puerto Rico's Olympic Village in Salinas - about an hour south of San Juan. Young athletes jump into the Olympic pool one by one and start swimming laps. Kids from around the island try out for athletic scholarships that could lead to a spot in Puerto Rico's Olympic team. PAOLA SANTIAGO: It's an honor to represent Puerto Rico, our country, in the sports. PENALOZA: Meet 17-year-old Paola Santiago. Like most Puerto Ricans, she refers to the island as pais, the country, even though it's not. It's a U.S. territory. Paola says it never even occurred to her to try out for the U.S. national swim team. SANTIAGO: I wouldn't feel that happy because I feel like I feel more comfortable being here and represent Puerto Rico. I don't live there. I don't do anything there. PENALOZA: There meaing the mainland. Smiling comes easily to Paola, even as she gets ready for her second two-hour-long training session of the day. She is determined to make her island proud, just like tennis player Monica Puig did last summer in Rio. UNIDENTIFIED CROWD: (Chanting) Puerto Rico. PENALOZA: Puig gave the island its first gold medal, and Puerto Ricans went into a collective explosion of pride when she won. PENALOZA: Here, almost everyone feels passionate about sports and about the importance of Puerto Rico having its own Olympic Committee. Manuel Natal is a member of Puerto Rico's House of Representatives. MANUEL NATAL: Puerto Ricans value the sovereignty that we have in terms of sport. It's something that it's part of our national identity. PENALOZA: Swim coach Fernando Delgado runs the stopwatch on the pool deck at the Olympic Village. Delgado has been coaching here for 31 years. DELGADO: I can't explain you the emotion that we feel, the feelings about that moment. PENALOZA: That moment is when he marches at Olympic ceremonies around the world. At a loss for words, he points to the goosebumps on his large, tanned arms as a way to explain his emotions. Delgado's overwhelming pride in Puerto Rico's athletic independence is shared by many on the island. He says this is the only arena where we feel like an independent nation. Marisa Penaloza, NPR News, Salinas, Puerto Rico. Transcript provided by NPR, Copyright NPR.